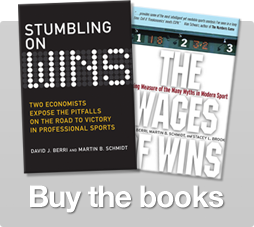 The Wages of Wins Journal – Page 4 – Taking aim at the lies and damned lies in sports with stories written by the numbers. Dr. Nola Agha offers a brief comment on the Greek Olympics and explains how pictures can be misleading. Jill Harris discusses the gender economics of the CrossFit games.